On a recent rainy morning, Léna Diop, 21, and a few members of her family get a slow start to their day in the working-class Dakar suburb of Guédiawaye, Senegal. It is only when the rain stops that Léna is able to send her cousin to the bread kiosk to buy baguettes for breakfast. 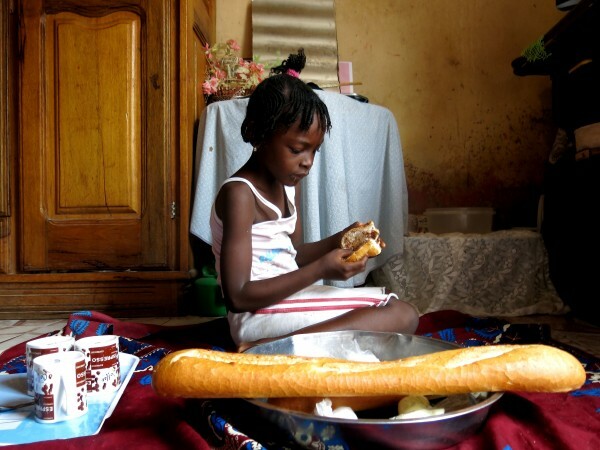 Léna’s 6-year old sister, Coumba Ndiaye, tags along to make sure she gets what she wants — and what she wants today is bread with a peanut butter-based chocolate spread that tastes a little like Nutella. “It’s delicious,” she says and tears into it right away, while her 12-year-old cousin, Mimi Ndiaye, stops at the corner store to buy the other breakfast necessities: a few bags of sugar, powdered milk, and a couple of sticks of Nescafe. They get everything they need for about 1,000 FCFA (about $1.74 USD). Back home, Léna fires up a small charcoal furnace to reheat the rest of yesterday’s dinner — macaroni in an onion sauce — to spread on the baguettes. Coumba is tempted to eat a little bit of that, too — and so she does. Senegal hopes to become a middle-income country in the next 20 years and there are some promising signs of success. The average income has been creeping up over the years and the economy has shown general signs of growth. Parts of Senegal still experience the occasional famine, but in general, people are eating more and eating better than ever before. Still, the level of poverty here is high — at more than 46 percent of the population, according to the World Bank. For families like Léna’s that struggle to make ends meet, the price of a day of meals is sometimes a challenge. She says that sometimes Coumba wants more, like cookies and special juices — the caprices of a little girl. “Sometimes there’s not money for everything that Coumba wants,” says Léna. They live in a small house with lots of people — more than a dozen — but all part of the same extended family. Despite all the people in the house, there is no refrigerator. They have a cooler that they can fill with ice, but that doesn’t leave much space to stock up on perishables. If Léna decides to cook, she has to go to the nearby market. And today, she plans to make ceebu jën, Senegal’s national dish of fish, rice, and vegetables. The fish seller starts off by trying to sell her a fish for 5,000 FCFA ($8.69 USD), a price that surpasses the amount of money that Léna has budgeted to buy everything she needs for today’s ceebu jën. They settle on another kind of fish for 1,000 FCFA, but even that is more than Léna would like to pay. Fatou Fall, the fish seller, says to blame it on the rain. “When it rains, the fish run away,” says Fall. She says that she bought the case of this particular fish for 80,000 FCFA today ($139), but when the rain ends she can buy that same case for 50,000 FCFA ($86.88). It’s the same story all over the market where Léna picks up micro-quantities of items: four okra pods, a corner of a pumpkin, one-third of an eggplant, 2 pieces of dried fish, and a handful of scotch bonnet peppers. It’s a paradox that, in an arid country that gets rain only a few months of the year, the heat and humidity of the rainy season makes it harder to grow vegetables. It also makes it hard to keep them fresh. “The rain spoils everything,” says Ibrahima Diallo as he tries to sell Léna a tiny cabbage. At least the cabbage is local: His carrots are from France, the onions are from Holland, and the sweet potatoes are from Mali. As much as Léna does not relish the market, she loves to cook. The ceebu jën has multiple steps, many beginning and ending with the mortar and pestle, which Léna (and Mimi as her helper) uses to pound at least five different mixtures together. Each one helps build layers of flavor in the dish. Ceebu jën is not fast food; it takes a couple of hours to do it well. When it is done, she spreads out the rice on a big communal bowl and arranges the fish, vegetables, sauces, and pastes on top. She and the girls eat together, the traditional way. Léna separates out a portion for one of her older brothers to eat when he comes home from work. Another brother is around the house, but likes to eat alone. “Some people like to eat alone, but me, if I’m alone, I won’t even feel like eating,” says Léna. But times are changing. With almost everyone working to keep the family afloat, it is not always possible to eat together. In the evening, Léna says that her older sister, Mami, sometimes cooks for the family, but more often, everyone goes their own way. For example, later that night, Léna and Coumba eat lakh, a thick millet-porridge served with sweetened sour milk that they buy from a neighbor. But another member of the family, Léna’s uncle, Saliou Dioum, stops at an informal restaurant a few blocks away. He eats in a dark room around a table with several other people. They eat fast, pay fast, and leave their seats to the next client. Though the family is often unable to eat all together and meeting the price of meals is a challenge, Léna still enjoys cooking. Pledge your support for the eradication of poverty and hunger at one.org/globalgoals and keep up to date with developments by following #GlobalGoals.